This is my stop on the blog tour for The Avenger: Thomas Bennet and a Father's Lament, by Don Jacobson. It is always a pleasure when Don Jacobson is my guest. I like reading his thoughts on the Wardrobe. Today though, Don shares with us a character vignette/interview and an excerpt. I think you will like getting to know this Thomas and Frances (Fanny) Bennet a bit better. The Avenger: Thomas Bennet and a Father's Lament was a MAE Favorite of 2018. I hope you'll take a look. From a brief prepared by Adelaide Reynolds, Research Department, Bennet Family Trust, September 23, 1948. As I walked into the bookroom, ably escorted by Hill, the young butler serving this smallish Hertfordshire estate, I was struck by the floor-to-ceiling bookcases which lined this well-appointed room. The general atmosphere, light and airy despite dozens of feet of richly-stained shelves, inspired a sense that this was a space designed for contemplation but able to accommodate vigorous debate. From time-to-time a gardener’s shape could be perceived moving through the grounds beyond the windows: their crystalline panes new from France in the early 1690s, in 1948 still admitting ripping waves that warmed the library and cast its occupants in a golden hue. The Founder, Mr. Thomas Michael Bennet, was seated behind the great oaken worktable which, while its provenance extended back to the Glorious Revolution and then forward through ten generations of Bennet men, none-the-less firmly established that this man was now, as he always had been, the Master of Longbourn. Contrary to the sense which Miss Austen left of the Bennet patriarch, he showed none of the legendary indolence which had been his image for nearly a century-and-a-half. His uniquely shaped eyes, hazel-green, alertly began to scan my figure as if he was seeking to take a preliminary measure of me before I had a chance to utter a word. Then he rose, pushing the wheeled chair back with his legs. He stood, perhaps, nine inches over five feet. His frame was trim and tending toward athletic, which surprised me as, schooled by Miss Austen, I had assumed that he would have been shaped more like men of his age in the current where/when, rounded by too much rich food and drink and too little exercise. Perhaps more akin to Sir William Lucas. True, his hair was thinning, however, his face was unlined beneath a skin glowing from the regular rounds of golf which, my brother Walter had assured me, had become his passion. I will admit that I was taken by the manner with which his figure “V-ed” from his shoulders to his hips, made most apparent when he buttoned the grey jacket of what was a masterly evocation of Saville Row artistry. His greeting, combined with an outstretched hand, was awesome in its familiarity. Who was I, a recent hire into the Trust after my graduation from Oxbridge, to be deputed to interview The Founder and his Lady? Yet, there I was. Mr. Bennet reached out to shake my hand and greeted me in a rolling baritone, “Ah, you must be another of that remarkable clan we have come to call ‘Research Reynolds.’ I am aware of your brother’s role in the Department. I must admit that my sensibilities, rooted as they are in the late Eighteenth Century, still find women in academic roles unique but not unsettling. He left me standing to admire the tooled leather bindings encasing the hundreds upon hundreds of volumes in the Longbourn collection: while smaller than Pemberley’s vast hoard was well-curated and tailored for a family of more modest means. However, I had little time to contemplate for Mr. Bennet returned with a woman upon his arm. I was stunned; for, while I had perceived The Founder as a total entity in our brief conversation, I now could sense a soaring of spirit when this woman’s presence was combined with his. They were, to use a hackneyed phrase, a force of nature. Bennet provided the offices of introduction. Soon we were seated in three leather wingbacks around a low table on which rested a simple bowl filled with cut flowers. Frances Lorinda Bennet, born Gardiner, was a delightfully shaped woman of middle years. She was clearly a lady who had birthed children but had been fortunate to retain a semblance of her figure that bespoke of the astonishing beauty she had been when she had first discovered the tigress power of Eve. As with most blonde women of a certain age, her hair was streaked with the purest white that added highlights to her tresses. A gentle dusting of freckles graced her lightly tanned cheeks and the bridge of her nose bespeaking of a love of the outdoors in her much-vaunted gardens. Taking her appearance as my cue, I asked about her fascination with gardening. Mrs. Bennet settled back into her chair and smiled brilliantly, “Well, Miss Reynolds, it seems that word of my love of rosa floribundae has made it to Town. Fine…I will satisfy your curiosity. “My Grandfather Gardiner, I am not certain how many ‘greats’ he would have been, returned from the Far East—he was with Mr. Christopher Bennet, you know—bearing a number of cuttings from rose plants cultivated in China. His wife planted them in her first garden, and when they installed themselves in Hertfordshire, she uprooted her best and favorite bushes and transplanted them in their garden behind their Meryton house. “Every Gardiner woman, even my sister Mrs. Philips, has made the cultivation of roses her particular mission. Mrs. Bennet snorted and proudly replied, “No, my dear, they were so called because they were the beauties of the county! I am beyond certain that you have seen the portraits at Thornhill, Pemberley, and Selkirk. I defy you to find another collection of young ladies with whom they could be compared. Then, directing her sky-blue, nearly purple, orbs back at me, she continued, “But, in answer to your slight misconception about my girls and roses. While each of them certainly loved the flower, only one, as I understand it, Lydia, whom all seem to refer to as the Dowager Countess, assumed my mantle. I would commend a tour of the hothouses behind Selkirk. There you will see the extent to which she carried the Gardiner legacy. “On top of that, the family apparently gave her free rein over all of their houses, the Beach House at Deauville, and, beyond the beds here, the Longbourn cemetery. “Her handiwork is evident at Pemberley, although Mr. Fitzwilliam Darcy’s mother, Lady Anne, had been the prime mover. “Mr. Bingley, my Jane’s husband, averred that the sunshine yellow Lady Anne roses reminded him of his wife. Lydia made sure there was an ample supply of those transplanted from Pemberley over to Thornhill so that Bingley could grace his wife with a bouquet any time he was so moved—which was nearly every day. During this oration, I glanced over to Mr. Bennet. His eyes had assumed a faraway look and swam with unshed tears. Mis wife’s speech was shaking his memories of young girls in their first bloom of womanhood. Mrs. Bennet’s speech broke through my own reverie, “Lydia also found a way to create a hardy, late blooming white cultivar, suitable for outdoor plantings. Look at the Kympton Vicarage. Mr. Benton and his Mary adored late afternoon walks amongst the bushes. Of course, the white rose was perfect for my middle girl. It symbolizes purity, and if I have learned anything of the woman into whom my daughter grew, her spirit and motives were of a kind with fresh-fallen snow, unblemished. The lady nodded and replied, “You have the right of it. Lydia had originally planted four, but I chose not to mention the last for she did that to honor me, calling me the Mother plant. I would not wish to draw undue attention to myself as I have always felt that my girls were the ones who climbed to great heights. “That would be the one which tends toward a tangerine or salmon hue,” I added. “Yes, it has always been my favorite. If you step out into Longbourn’s garden right now, you will find R. chinensis in full bloom. “The fifth rose at Deauville was not planted by Lydia, but rather in her honor just three years ago. The two Countesses, Georgiana of Pemberley and Anne of Matlock, added the fifth rose as a memorial to her for all that she did for her sister. Mr. Bennet interrupted his wife’s flow of thought saying, “Yes, our youngest ate life with a large spoon. Of course, Miss Reynolds, you must realize that we have only known her as a young girl, prone to an adolescent’s failings. 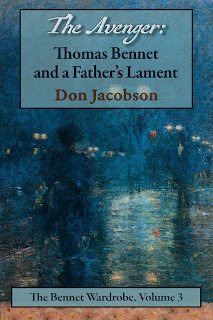 Mrs. Bennet chimed in, “What little I have been able to learn about Lydia’s life in the years after she left home, it seems that she drew closer to her sisters and built a life with her husband and their sons. With that, the discussion of roses ended, and the couple rose to bid me farewell. 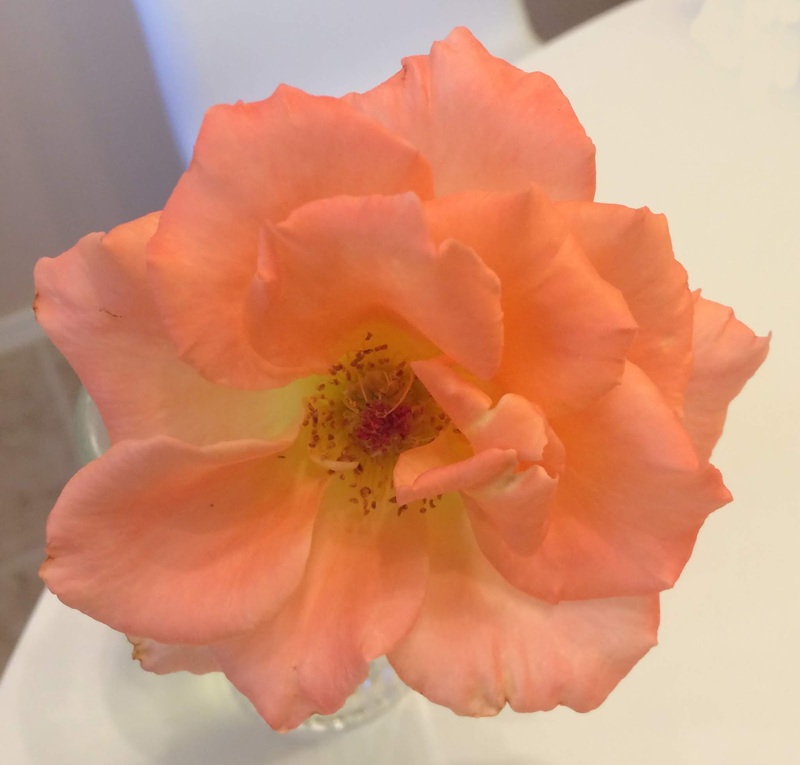 As Mr. Hill escorted me from Longbourn’s bookroom, I caught Mr. Bennet reaching down and pulling a salmon-colored blossom from that bowl on the low table, embellished his wife’s short coiffure with a perfect Rosa Chinensis. 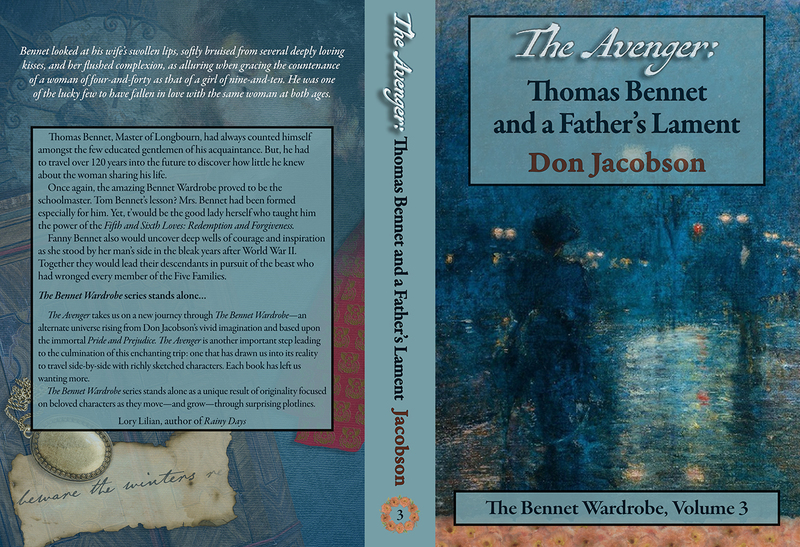 Thank you for this opportunity to present this character vignette that might have appeared in The Avenger: Thomas Bennet and a Father’s Lament. I look forward to your comments. 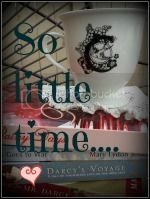 I hope you will enjoy this little excerpt that offers a bit more about Mrs. Bennet and her roses. This excerpt is ©2018 by Don Jacobson. Any reproduction—either in print or electronic—without the expressed written consent of the author is prohibited. Published in the United States of America. Fanny Bennet carefully brushed dirt clumps and grass clippings from the knees of her pantaloons, what her grand-daughters and nieces called slacks, as she finished her afternoon’s attention to the manse’s rose beds. She stood and knuckled her lower back with clenched fists, trying to relax middle-aged muscles unused to being stretched as they had been for the past several hours. What would Mathilda Lucas and Louisa Goulding have said if they spied me wearing a pair of Annie’s jodhpurs. The two of them probably would have fled down Longbourn Lane cackling like a pair of prize biddy hens. T’would be the stuff of Meryton gossip for weeks, if not months. I could not care less! Back in my day, t’was always near impossible to do the right type of weeding around the base of the plants. Ground-length skirts and stays were never intended to permit a lady to drop to the ground. Of course, the gardener and grounds’ servants could be tasked to do the job, but oh lordy, they would make a first-rate mess of things. Now, in this age, I can get down amongst my plants, making sure that the fall fertilizer is worked into the soil around the roots. The reaches behind the manor house had always been special to Mrs. Bennet. Before she had moved to Longbourn after her wedding, the pretty little wilderness stretching away from the kitchen garden had become overgrown, having been ignored by Tom’s father, Samuel, in the decade after Mrs. Lizzie’s death. His heir, while a farmer, concentrated his agrarian efforts upon wheat and barley as well as turnips and swedes instead of ornamentals. The young matron had been given carte blanche by her new husband when she suggested that, in addition to redecorating their home’s public rooms, she begin the recovery of the eastward-facing acre. Fanny had always lived with a purpose. Once she had set her mind to a project, she would not let it drop by the wayside. Longbourn’s distinctive beds were the first of many schemes she undertook as Mrs. Bennet. Upon Bennet’s say-so, she descended upon her mother’s garden behind the Gardiner residence on High Street: a walled space that was a riot of sharp-edged greenery. While Longbourn’s workers chopped brush and stripped back turf to reveal Hertfordshire’s rich, dark loam, the newly-increasing young wife began thinning her parent’s largess, carefully splitting away excess runners and then taking cuttings of the more unusual varieties before removing about one in every three mature plants. All were carted back to the estate to eventually grow into broad-shouldered bushes filled with the scents and colors determined to calm even the most troubled soul. In her mind’s eye, she could see her five girls, each in brilliant white gowns and broad-brimmed bonnets, moving sedately between the beds. The older ones were armed with shears while the younger carried the baskets into which Jane and Lizzy would drop the flowers destined for the countless vases and displays throughout Longbourn’s halls. Now they are all gone. Nothing is left in this time to comfort me except my memories…and my roses. Odd how my work still lives after over 150 years. I guess that is the best sort of immortality. However, Fanny Bennet knew she had no cause to repine. While her children had gone on ahead, she still had two of her grandchildren, Tommy and Eloise, as well as a fleet of great grandchildren who were of an age to call her ‘Grandmother.’ Those children were blessings…as were disparate nieces and nephews. And, then there was Eileen. Try as she might, Fanny could not separate the image of her Jane and Jane’s descendent. As Mrs. Bennet stood by the tilled ground, she looked across the sward to the oaken boundary under which branches Miss Nearne rested, nose buried in a book—probably another deep study of the human condition. The last time Fanny had asked after Eileen’s reading, the quiet young woman simply held up the slender tome which was entitled Pour une morale de l'ambigüité. [i] Eileen's curiosity about the nature of Man's navigation of life grew from her own trials. And, thus, an inner difference from Mrs. Bingley was added to the more obvious man-made physical ones. While Mrs. Bennet had undergone many changes since Lizzy and Jane had married and her husband had once again refocused his ardor upon her, she was still much her old self in terms of her interests. Chief amongst those was seeing her girls well settled. And given that she saw Miss Eileen Nearne as her daughter separated by one hundred-odd years, she had recently been sorting the cards of her memory. A powerful resolve now gripped her. She straightened up and called out to Miss Nearne saying that she was going into the house to bathe before the planned trip into Town for dinner. She reminded Eileen that she was included in the invitation and should not tarry in the garden. The younger woman never looked up from her book - how like two of my other daughters - choosing simply to wave in acknowledgement. [i] Pour une morale de l'ambigüité (The Ethics of Ambiguity) by Simone de Beauvoir was originally published in 1947. Thank you, Janet, for hosting me today! It's my pleasure, Don. I have been looking forward to hosting you. Mrs. Bennet rarely appears in the Wardrobe Series...in fact, I cannot recall any appearance by her except the scene in "The Keeper" in June 1815 when she, Mary, Lizzy, Lydia, and General Fitzwilliam are gathered in Longbourn's parlor. There she reverts, albeit momentarily, to the "old" Mrs. Bennet. I think you will like reading this, Vesper. Liked the excerpt and am enjoying this version of Mr. Bennet and his relationship with Mrs. Bennet. You will enjoy reading of their relationship. Don did a great job with them and making them real. DB...Immersed as I am in the Wardrobe's Universe, I am of the sense that this is the true relationship between them...that they passed through their trials and used the Fifth and Sixth loves to redeem and forgive. I loved Mrs. Bennet view of Mary, great excerpt. Congratulations on the release of the new book. Yes, as she came through her own veil of fears, Fanny found the beauty that was her middle daughter. Oh, she did slip (see The scene in The Keeper in 1815...but I lay that to the account that she had been in mourning for 5 months. Thanks for stopping by Kate. It was nice to see Mrs. Bennet "see" Mary! Sorry I am late...well then, as I brush tears from my cheek, that interview was so achingly touching. I think, if you don't mind, I will 'cut and paste' and insert it into the book. Speaking of which, it was captivating! These little side vignettes have become, for me, a wonderful way to explore traits and tendencies of the characters...ones that, while present in the main narrative, would become distracting if a longer explanation was offered. Recall the vignette of Wickham and the reporter from the Times in Vienna where he gave the man his journals? Wasn't it a wonderful interview! I loved it too, Carole. That's a fantastic idea to insert it into the book. Another fantastic one and yes, captivating by Don! I'm so glad you stopped by.